Most legal and financial firms are aware that content marketing can attract new leads, increase their client base and establish or deepen their reputation as an authority in a specific niche. But most organisations lack an effective strategy and the resources to make a significant impact on their bottom line. At Magna Carta we work with legal and financial firms to develop a content strategy geared around the needs of the business. Content strategy involves evaluating the business and customer needs and providing strategic direction on how content can help the business achieve specific objectives. It’s a roadmap for your content that defines purpose, key messages and audiences for each channel in your marketing plan that work together to increases brand awareness, influence buying decisions and pull your target audience into your sales funnel. With a proper strategy in place, you can choose to develop your content in-house or use our team of content experts to develop your custom content, on time and to budget. Custom content is the raw material used in content marketing, often presented in a variety of formats, including news, video, white papers, research report e-books, infographics, case studies, interviews, how-to guides, question and answer articles and photos. These are also known as ‘content assets’. From one-off projects to multi-asset campaigns, our specialised team will help deliver your content assets. Contact us to start a conversation. The buyer’s decision journey, where prospects move through various stages to reach a purchasing decision, is a significant component of the B2B customer journey. Content marketing that uses relevant content assets can bring value to all aspects of the buyer’s journey, presenting opportunities to the buyer for engagement with your business. 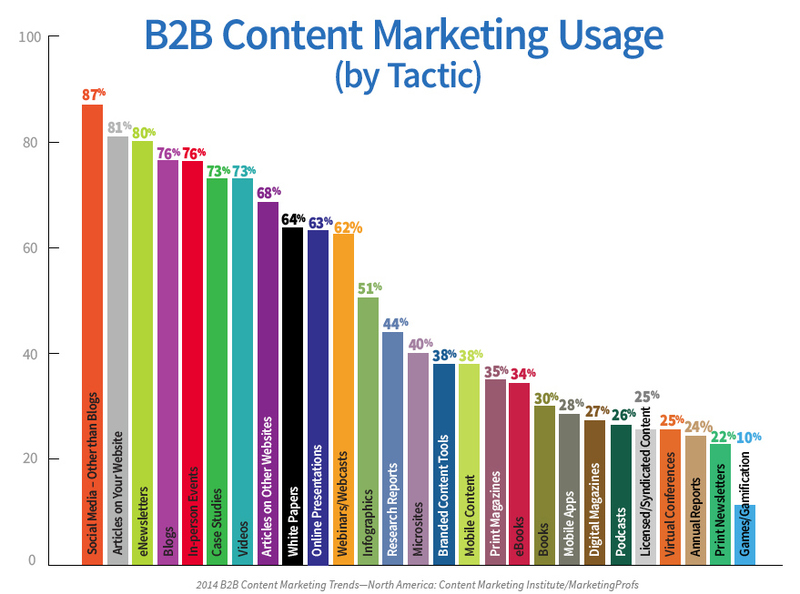 According to CMI’s 2014 fourth annual content marketing survey, (n=1217), North American B2B marketers use an average of 13 content marketing tactics, compared to their UK survey which revealed that UK marketers use an average of 14. You can see below the different types of content assets that make up these tactics.